Most of the part is camping, include all meals and tented accommodation. The most challenging trek in Bhutan and ranks amongst the very finest anywhere in the Himalaya. This Snowman trekking undertaken by only a handful of trekkers each season and accesses Lunana, the most remote region of Bhutan. The trek crosses eleven high passes over 4,500m that define the borders of Bhutan and Tibet. Savouring views of Chomolhari and Jichu Drake, we follow trails through yak herders encampments and isolated farming settlements as we prepare for our trek to Lunana. Amid a constant backdrop of 7000m peaks we discover a region of tiny Buddhist monasteries and secluded villages that are isolated from the rest of Bhutan for many months of the year. Upon arrival at Paro airport, received by our representative and transfer to Thimphu. Overnight at the hotel in Thimphu. Visit the Memorial Chorten, Tashichhodzong, National Library, Painting School, Traditional Medicine Institute and Handicrafts Emporium. Overnight at hotel in Thimphu. Drive to Punakha via Dochula pass (3100m), through magnificent forests of rhododendron and magnolia. From the pass one can have the panoramic view of eastern Himalayan peaks and enticing view of the Lunana route. Picnic lunch at Punakha by the riverside. Enjoy the view of Punakha Dzong, built in 1637 during the time of Shabdrung. The Dzong is now used as the winter residence of monk body and administrative centre of the district. After lunch drive on to Tashithang following the Mo Chu river. Camp at Tashithang at the end of road at an altitude of 1600m. The trek starts by the riverside, following a well made path through semi tropical forest. This part of the area is quite wet and one has to be careful of leeches. Also for flower lovers there is abundant of wild orchids here. They days walk is fairly gentle climbing upto Damji village. Camp at Damji at an altitude 2250m. Walking time 5/6 hours. The path continues through sub-tropical forests and villages upto Gasa Tshachu (hot spring). The Tshachu is a famous place where people from all over the country come to have bath, due to its curative powers. Here there are four pools of different temperature from mild to hot. Hot lunch will be served close to spring. After lunch two hours stiff climb to Gasa Dzong. Camp below the Dzong at an altitude of 2900m. Walking time 6/7 hours. After breakfast, visit the Dzong which was built in 17th century, to protect the valley against Tibetan invaders. The path starts with stiff climb upto Bele la pass (3700m) through bamboo, rhododendron, juniper and fir forests. Then descend for about half an hour to camp at Chamsa at an altitude of 3650m. Walking time 6/7 hours. The trail starts by descending to the bank of Mo Chu river. Lunch will be served at the side of bridge, across the river. After lunch climb up gradually to Laya crossing the army camp. Overnight camp at an altitude of 3800m. Walking time 8/9 hours. One can go around the villages, visiting houses and the people. Laya people are very friendly and will happily pose for photographs. Women of Laya wear a special dress and typical bamboo hats decorated with turquoise and silver ornaments. Cultural evening with dances performed by local girls. From Laya we descend to army camp and continue following the river till the turn off point to Rhodophu. After lunch continue the climb through rhododendron bushes till we reach the camp at altitude 4,350m. Walking time 8/9 hours. Today is the longest day of the trip and it is important to start early. Start at about 5 a.m. by climbing to Tsimola (4700m). After crossing the first pass and the little summit, one can have superb view of Lunana, Mount. Chomolhari and Mount. Jichu Drake. The path is flat for another four hours till climb to Kangla Karchula pass (5080m) is started. The view from the path is breathtaking and whole range of mountains including Masagang, Tsendgang, Teri Gang can be seen. After the path, it is very long descent to Tarina valley. Camp at an altitude of 3980m. Walking time 10/11 hours. The walk leads down through conifer forests following the upper reaches of the Pho Chu. The trail then climbs over a ridge and drops to Woche at 3,800m. Walking time is 6/7 hours. The trek starts through juniper and fir forests and further ahead through rhododendron bushes. 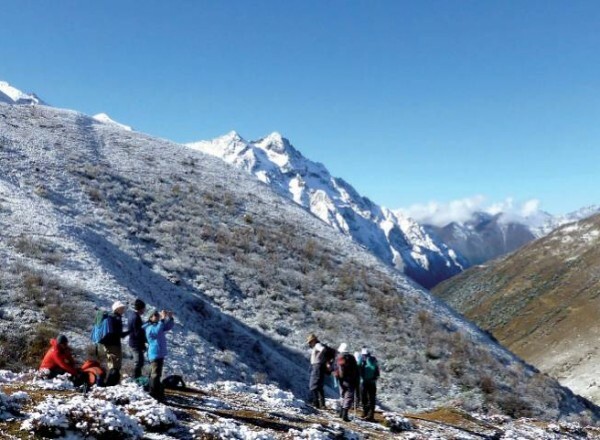 Climb up to Keche la pass (4,480m) where one can have the great view of mountains. After the pass, descend to the riverside walking through the village with stunning view of table mountains and others. Follow up the river till Lhedi village, which is one of the main source of Pho Chu. Camp at an altitude of 3,650m. The trek continues following the river, rising gradually to Choejong village. After lunch, visit the Choejong Dzong and continue walking towards the wide valley. Cross the bridge to reach Thanza camp at an altitude of 4,000m. Walking time is 7/8 hours. We can walk around or climb up the ridge for fascinating view of lakes and mountains. The trek start by climbing the ridge, with great view of the table mountain and Thanza valley below. The ridge altitude is 4,500m and it rises gradually upto 4,650m. After lunch walk upwards the left side of the bridge enjoying the view of snow capped mountains. Further after climbing ridges, you reach the camp site of Tsorim at altitude 5,125m. Walking time 8/9 hours. This is the highlight of the trip and day starts with a short climb to the Tsorim lake. Walk on the side of the lake enjoying the panoramic view of Gophula ranges. The last climb to the Gophula pass (5230m) is very short. After the pass descend to the base camp, walking along the ridge and enjoying the great view of Gangkar Puensum. If interested, one can divert to the left side to climb up the pyramid peak for a better view or you can go down to base camp nearby Sha Chu at the altitude of 4,970m. Walking time is 6/7 hours. Its time to leave beautiful mountains, but the trek is not yet over. 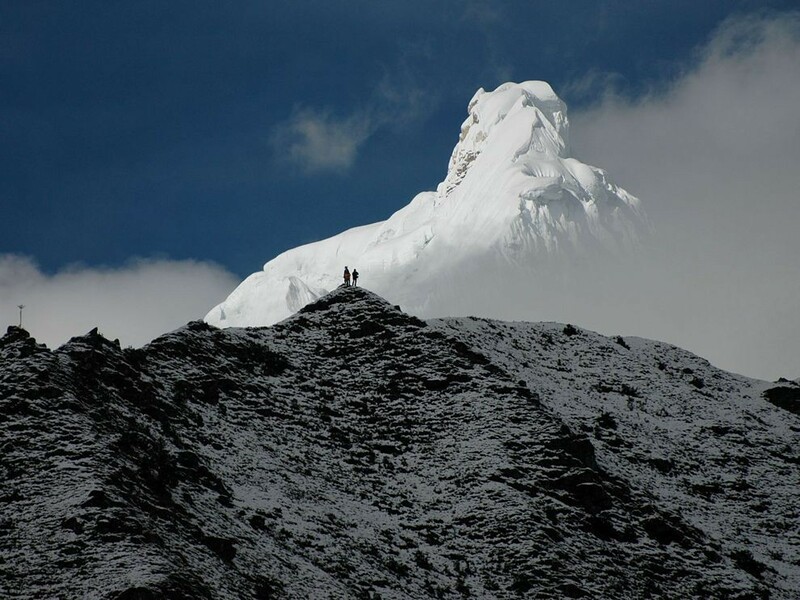 The trail further follows the Sha Chu and descends gradually to Geshe Woma at the altitude of 4200m. Walking time is 6/7 hours. The path continues following Sha Chu for two and a half hours until the stiff climb to Sakala begins. Visibility along the Sakala trail is poor so one must see top of the ridge for guidance. Lunch nearby a yak herders camp. After that climb up to Sakala pass at an altitude of 4800m. Descends to the lakes and another short ascent leads to Wartangle pass (4590m). Scenery once again is stunning with small lakes and the mountain peaks. Camp at the altitude of 4,000m. Walking time is 8/9 hours. A short half hour climb leads to Juelela pass (4400m). After the pass descend to the riverside through dense rhododendron, juniper and conifer forests. After the bridge a short climb leads to Dur Tshachu hot spring, where Guru Padmasambhava is suppose to have taken bath in 8th hot spring. Walking time is 5 hours. From the pring it is a long and steady climb again with great views of the mountains in Lunana. 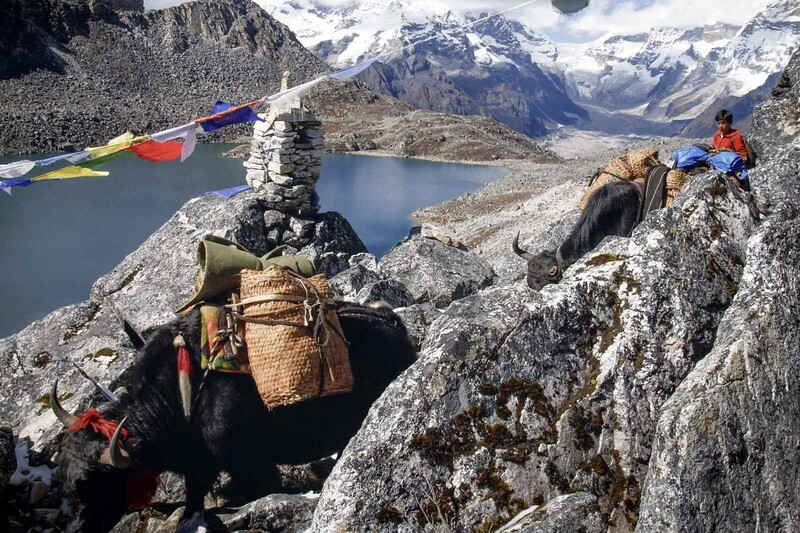 You also come across blue lakes and yak herders camp at altitude of 3850m. Walking time is 8/9 hours. 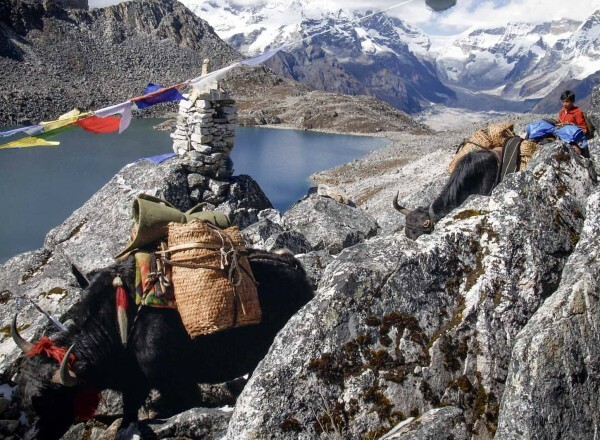 This is the last day of the trek where you change from yak to pack ponies. The path follows the Chemkhar Chu, descending gradually with few climbs. The trek ends when you arrive at Dur village where our transport will pick you up and drive to the lodge in Bumthang. Bumthang valley is center of cultural wealth. The hills around valley are filled with monasteries dedicated to Guru Padsambhava. Also it is home to one of the great Buddhist teachers, Pmalingpa, to whose descendants the present dynasty trances its origin. Explore valley visiting , Jakar Dzong, Kurje Lhakhang, Jambet Lhakhang and Tamshing Lhakhanng. Overnight at the lodge in Bumthang. Tongsa is the ancestral home of Bhutan’s royal family. The crown Prince of Bhutan traditionally becomes Penlop, (Governer) prior to crowned as King. Tongsa Dzong, built in the master piece of Bhutanese architecture which has been traditional home of all four kings of Bhutan before they crowned as King. Standing above this fortress is, Ta Dzong which once guarded this place from internal rebellion and provides visitor more insight into the historical significance of Tsonga in Bhutan’s history. Overnight at the lodge in Bhutan. After breakfast drive to Paro. Evening at lesiure or visit traditional farm house. Overnight at the hotel in Paro. Day 26:Full day sightseeing in Paro. Visit Drukgyel Dzong, Ta Dzong (National Museum), Rinpung Dzong and Kyichu Lhakhang. Overnight at the hotel in Paro. Transfer to Airport for the flight to next destination. All Trekking Equipments (2 men sleeping tents, Kitchen Tents, Dining tents, Toilet Tents, Petromax, Cooking Utensils etc. Trekking Guide and trekking cook along with supporting staffs.